Meet Pierce! Pierce is a sweet kiddo who is about to turn 3 years old this month! He was born with a hernia and mild cerebral palsy. He lives in a foster family and has done so well there. 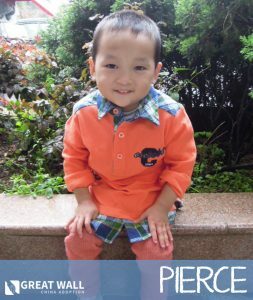 Pierce was 2 years old when his file was prepared. His caretakers indicated that at that time, he could follow instructions to wave goodbye, and answer how old he was! He has strong imitating ability and always likes to dance when his foster mom dances. He can imitate words, speak in 3-5 word sentences and respond to other’s asking for his objects. Pierce can point to different body parts and use his words to express his needs! He is currently receiving rehabilitation therapies and is improving. While he still needs the assistance of a walking aid to be mobile, he is making progress. If you’d like to review Pierce’s medical file, contact one of our matching specialists today! This darling kiddo’s name is Kenzie! She is a sweet girl who is about a year and a half old. She was born with Down Syndrome and a congenital heart defect. She is described by her caregivers as a sweet, adorable little girl who’s smile is beautiful and heartwarming. She is babbling to communicate her needs and is now able to stand with support. She also is able to hold on to a milk bottle and drink milk without assistance! She is a precious kiddo who would thrive with the love of a forever family. Please contact Great Wall if you would like to learn more! T his kiddo’s name is Teddy! Teddy will be turning four this January. He has some general mobility delays, but he seems to be doing well! He is able to walk in a walker and is now able to take several steps without assistance. He can understand his caregiver’s basic requests and is able to follow instructions. He may have language delays as well, but we are currently working to find out more information from his orphanage. 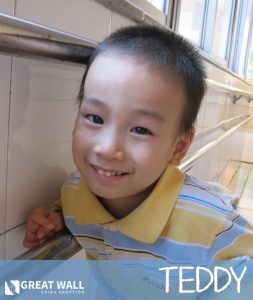 Teddy is a sweet, smiley kiddo who loves to listen to music and spend time with his friends and caretakers. If you’d like to learn more about Teddy, please reach out to Great Wall! **AGING OUT – FEB. 2, 2017** Rachel is a sweet girl from China who is 13 years old. 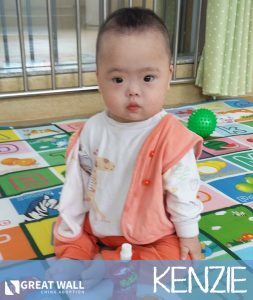 Rachel will age out of the China Adoption system on Feb. 2, 2017, so she needs a family to adopt her that will be traveling soon to China for another adoption. Rachel has some sight issues and she is delayed cognitively compared to her peers. She has lived in a Foster Family since she was 4 years old. Rachel is in 6th grade at a school for children with visual impairments. She lives at the school during the weekdays and then goes to live with her foster family on weekends. Rachel has an outgoing personality, she is talkative, active, quick thinking, thoughtful, a good observer and helpful with younger children. 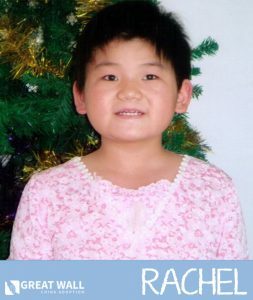 You can contact the China Home Finding Team at Great Wall if you would like to learn more about adopting Rachel. We hope we are able to find Rachel her Forever Family soon! 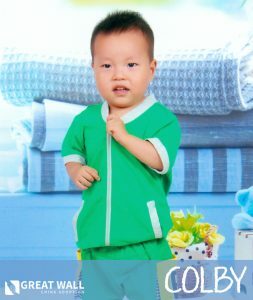 Jonah is a precious little boy from China that is 2 years old. Jonah was born with CHD but he received surgery on it and appears to be doing well now. At the time Jonah’s file was prepared when he was 17 months old he was babbling and saying simple words like “ma ma” and imitating the words that adults would say. Jonah could crawl on his hands and knees, standing for a while, and he could grasp toys and pass them from one hand to the other. He is described as being a smiley boy that gets along well with others. His favorite toy is a rattle. He loves being held by his caretakers. 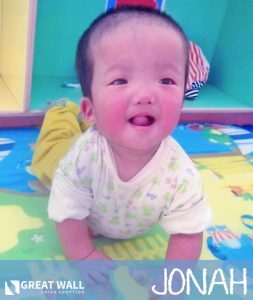 You can contact the China Home Finding Team at Great Wall if you would like to learn more about adopting Jonah. We hope we are able to find Jonah his Forever Family soon! Meet Julia! Julia is an adorable kiddo who is almost 6 years old! She had surgery to repair a heart defect when she was much younger and recovered very well. She is described as being cute, ready to smile, polite and positive! She is always helpful and full of enthusiasm. If other kiddos need assistance, she is always the first to let her caretaker know. 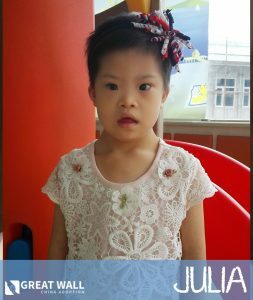 Julia is active and loves playing games with other children. She can express her needs normally and always pays close attention in school! She can get dressed on her own and can manage daily tasks! Julia is described as clean and tidy by her caretakers who note she loves folding her clothes before bed. Contact one of our matching specialists today if you’d like to learn more about Julia! Meet Elsie! 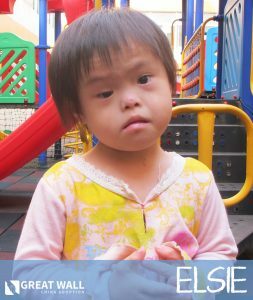 Elsie is a precious 5-year old kiddo with Down Syndrome. She also has a congenital heart condition and possible vision impairment. Elsie is a shy, sweet kiddo who loves to read picture books and play games! She is able to communicate her needs by babbling and does an excellent job at following the directions of her caregivers. If you’d like to learn more about her, please reach out to Great Wall! Check out her NEW video! Meet Robbie! 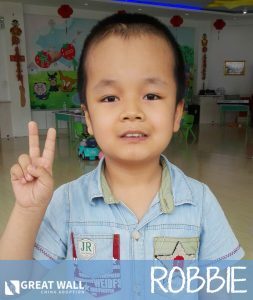 Robbie is an adorable kiddo who is 11 years old. He was born with hydrocephalus that he has received surgery for and a growth hormone deficiency that makes him a little smaller than his peers. He has normal cognitive development and is currently in school! He loves singing, dancing, playing the piano and is said to have a rich imagination. He is fairly introverted and is described as having so many hobbies! 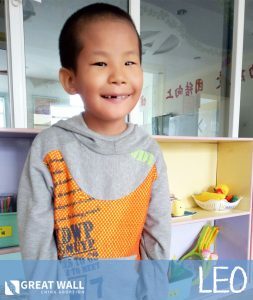 He loves reading and playing football outside and he gets along very well with other children! Contact one of our matching specialists today if you’d like to review his medical file! Meet Colby! He is a sweetheart who is 4 years old. Colby was born with Congenital Heart Disease. His file indicates that he has received a surgery for this but GWCA is currently requesting some additional information. He is described as having a very outgoing personality! His language development does not seem delayed compared to his peers based on his file. Colby loves playing with blocks and toys with other kiddos. He can successfully complete some self-care tasks such as getting undressed on his own and eating without assistance. Colby is very fond of listening to music and always has a ready smile. Contact a matching specialist today if you’d like to learn more about Colby!